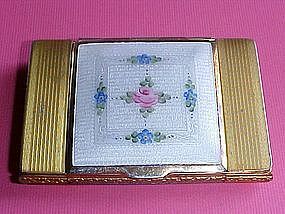 Wonderful vintage compact circa 1930's - 1950's. 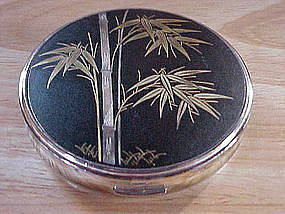 This beautiful Komai compact features a Bamboo plant made of inlayed silver and gold on a black iron background. 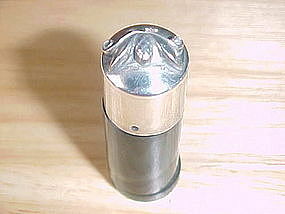 I believe the body of this compact to be made of silver. 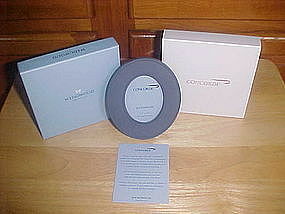 The back of this compact is signed " AMITA " and the inside is signed " CROWN " under the mirror. 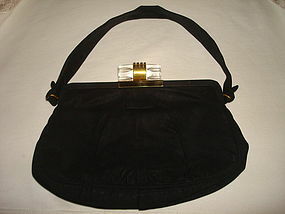 It is in wonderful shape and maintains it's original fabric powder screen. 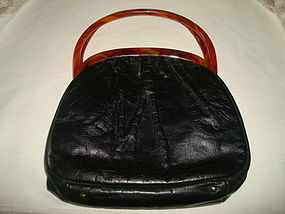 It measures approximately 2 7/8" in diameter. 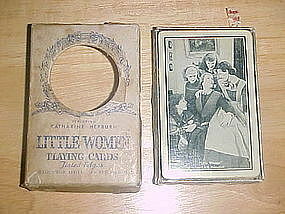 Vintage souvenir playing cards from 1933 movie " LITTLE WOMEN." This movie featured Katharine Hepburn and Joan Bennett. This is a full deck with no Jokers. 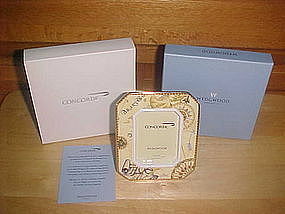 The cards are in very good condition and the original box is in fair condition. 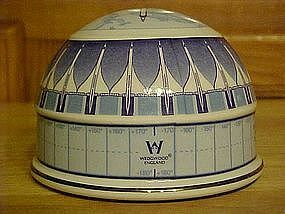 This is a rare and hard to find piece of Movie Memorabilia. 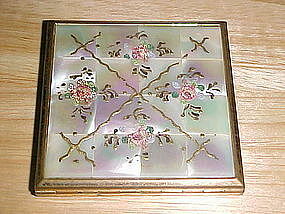 Nice 1950's ladies compact made of brass and mother of pearl. 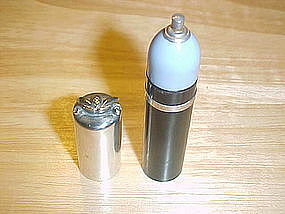 This compact is in very good condition and is complete with original powder puff. It measures 2 3/4" x 2 3/4". 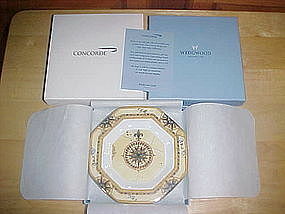 The compact is signed " ELGIN AMERICAN MADE IN U.S.A." The lid of the compact is made with sixteen cut tiles of polish mother of pearl. The tiles have a painted floral decoration which is original but has some wear. Still most of the hand painted decoration is there and still beautiful compact. Nice Walker China commemorative beer mug made for the M.I.T. Alumni Day in 1951. 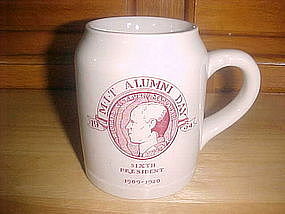 This mug features an image of the M.I.T. First President WILLIAM BARTON ROGERS. This mug is made from a heavy weighted China and is about 4 1/2" tall and is in Excellent condition!!! A great piece of M.I.T. memorabilia!!! Nice Walker China commemorative beer mug made for the 1954 M.I.T. Alumni Day. 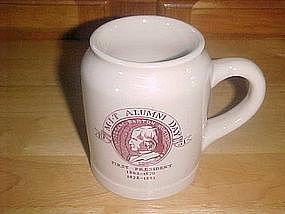 This beer mug features the M.I.T sixth President RICHARD COCKBURN MACLAURIN. This beer mug is made of heavy weighted China, stands about 4 1/2" high and is in excellent condition!!! A great piece of M.I.T. memorabilia!!! Very nice 1950's vintage Firemans Belt Buckle. 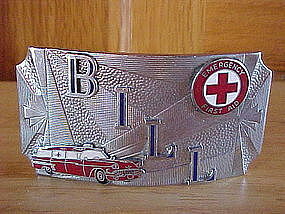 This belt buckle is nickle plated brass and has raised enamel details that includes a 1950's Fire Department Cadillac Ambulance, the name BILL and a emblem that says Emergency First Aid with a Red Cross in its center. These are all mounted on a Art Deco design background. This belt buckle is signed HOOK-FAST, REG. U.S. PAT. OFF. The buckle is in very fine condition and measures 2 3/4" wide x 1 1/2" high. Wonderful vintage 1950's nickle plated brass Fireman's Belt Buckle. 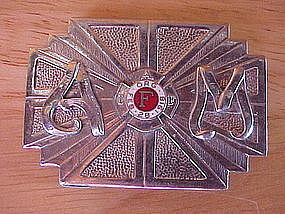 This belt buckle has raised initials of A and M and at the center has a raised Fire Department emblem with enamel work. The Fire Department emblem has the lettering I A F and in the center it has the letter F surrounded by a disk that says ORG. FEB. 28. 1918. This buckle is in fine condition and measures 2" wide x 1 7/16" high. The buckle is signed HOOK-FAST, REG. U.S. PAT. OFF. Super vintage fire fighters nickle plated brass belt buckle. 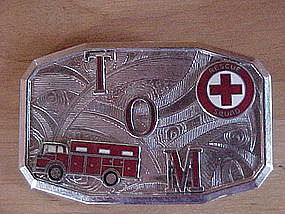 This buckle has raised enamel designs that include a Fire Rescue Truck, the name TOM and a Rescue squad emblem with a red cross center. These emblems are set on a Art Deco design background. This buckle is in very fine condition and measures 2 3/4" wide x 1 3/4" high. The buckle is sign HOOK-FAST, REG. U.S. PAT. OFF. Beautiful five pin Statue of Liberty Centennial set. 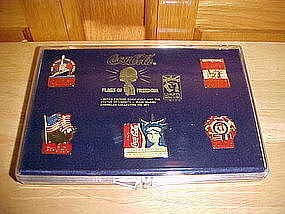 This five piece set was issued by Coca-Cola to commemorate the Centennial of Lady Liberty. These five enameled Coca-Cola pins are in Mint condition and are in their original case.